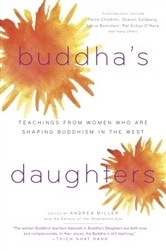 Teachings from women who are shaping Buddhism in the West. Compelling and informative teachings by the most influential female Buddhist teachers on a wide range of topics. Buddhism began to take root in the West at just the same time that women’s voices were arising to find expression here—after millennia of being relegated to the background. If that was a coincidence, it was an auspicious one, for the women who emerged as Buddhist teachers have been among the most articulate of Dharma-communicators—and they remain an indelible feature of Western Buddhism as the practice matures here. The remarkable range of their teaching is showcased in this anthology. The pieces featured touch on the topics that are at the heart of our lives—relationships, uncertainty, love, parenting, food, stress, mortality, living fully, and social responsibility. These approachable, engaging teachings illuminate Buddhist concepts and practices, such as meditation, tonglen, lovingkindness, cultivating gratitude, and deep relaxation. The book contains wisdom from such well-known and respected contemporary Buddhist teachers as Pema Chödrön, Ayya Khema, Sharon Salzberg, Toni Packer, Maurine Stuart, Karen Maezen Miller, Khandro Rinpoche, Jan Chozen Bays, Sister Chan Khong, Sylvia Boorstein, Pat Enkyo O’Hara, Darlene Cohen, Joanna Macy, Bonnie Myotai Treace, Tsultrim Allione, Tenzin Palmo, Tara Brach, Joan Sutherland, Carolyn Rose Gimian, Joan Halifax, and Charlotte Joko Beck.